Petrotech Services (PTS) is a specialist provider of cleaning and desludging services for the power, petrochemical and tank storage industries. PTS is an international tank cleaning company that has invested and expanded to be able to offer a range of associated services. Though the main area of expertise is still the desludging and cleaning of heavy product tanks such as crude oil the treatment of the waste sludge, cold cutting and pipeline cleaning, catalyst handing and lagoon remediation can also be provided by PTS, offering a total service to industry. Extracting heavy, high solids sludge requires expertise and specialist equipment. Tank owners who have employed a contractor without these will know the time and cost incurred from failed attempts. PTS technology ensures not only the completion of the contract on time and within budget, but also with the minimum amount of hours spent within the tank in a confined space and dangerous atmosphere. PTS owns a wide range of centrifuge and pre-treatment equipment that can be applied to recover oil from water sludge. This service can be offered alongside tank cleaning or lagoon remediation, or as a stand-alone contract. There are a number of reasons industries have lagoons, also known as basins, ponds and pits. Over time they need desludging to maintain their effectiveness. PTS offers bespoke solutions on-site, which take into account the environmental conditions. Hydro-abrasive cutting is the ideal solution for hazardous sites or where the product contained within a tank is an unknown chemical or sensitive to heat. As well as using high-pressure water jetting for tank cleaning, PTS offers a high-quality cleaning service on all types of equipment, including fin fans, heat exchangers, vessel jetting, risers and confined columns, and can offer UHP jetting when required. PTS uses air conveying equipment to remove and recharge the catalyst and associated bedding materials. PTS performs full risk assessments for all site tasks, as well as periodic and random site audits that cover all aspects of occupational health and safety, environment and quality. The company has ISO9001, ISO14001 and OHAS18001accreditations, which guarantee a professional and committed solution for each customer. 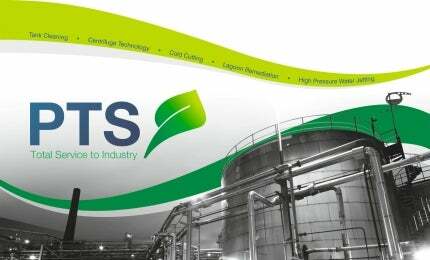 PTS has unveiled a new website that showcases the company's vast range of services. Petrotech Services (PTS) is a specialised industrial service company providing a range of services to the petrochemical, power and tank storage industries.